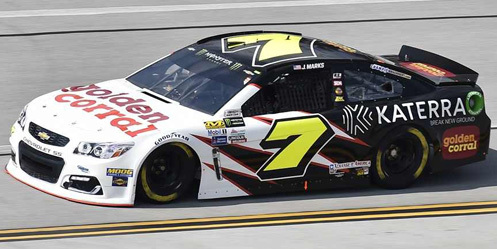 Justin Marks picked up the 1st last-place finish of his Monster Energy NASCAR Cup Series career in Sunday’s Alabama 500 at the Talladega Superspeedway when his #7 Golden Corral / Katerra Chevrolet fell out with crash damage after 16 of 188 laps. The finish came in Marks’ third series start. Marks, a sports car driver from California, was no stranger to Talladega. He transitioned into stock cars through the ARCA Racing Series in 2004, and made five starts on the superspeedway with a best finish of 8th in 2007. While more popularly known for his rain-soaked win at Mid-Ohio in the XFINITY Series last year, it’s interesting to note that his second-best finish of that limited schedule was an 11th at Talladega. Marks’ ride on Sunday was the #7 Chevrolet fielded by Tommy Baldwin Racing (TBR). Baldwin, a race-winning crew chief who has entered Cup cars since 2009, gave Marks his Cup Series debut in 2013, when he drove a GoPro-backed Chevrolet to a 30th-place finish at his home track in Sonoma. Other than a one-off for Front Row Motorsports in 2015 – again at Sonoma, and again a 30th-place finish – this had been Marks’ only Cup Series effort. After several difficult seasons, Baldwin sold his Charter near the end of 2016 and scaled back to a part-time effort in 2017. 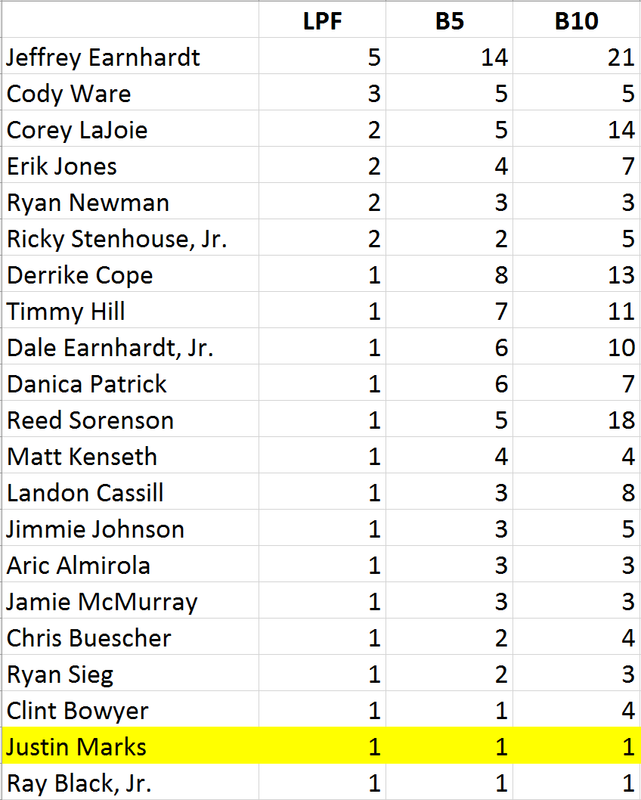 Through August, Elliott Sadler and J.J. Yeley shared driving duties for TBR in seven races with a best finish of 17th by Sadler at Talladega in the spring. On September 1, it was announced that Baldwin would join Premium Motorsports as the team’s Competition Director and also return to crew chief duties for their #15 Cup Series program. By the end of the month, Baldwin had sold his remaining assets in his #7 Cup Series team to Premium’s owner Jay Robinson. At the time of the TBR sale to Premium, Baldwin had two races remaining on its 2017 schedule: Talladega, which was originally going to see J.J. Yeley drive once more, and a one-off by Hermie Sadler at Martinsville. By Thursday, Yeley was replaced by Marks, whose XFINITY sponsor Katerra would join the Golden Corral-backed run at Talladega. 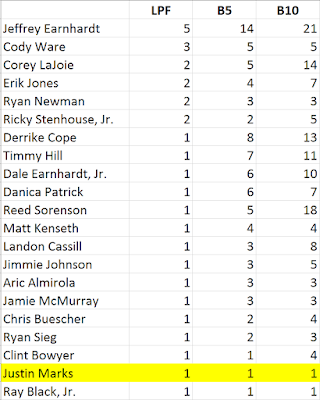 With exactly 40 drivers at Talladega for 40 spots, TBR’s lack of a Charter didn’t come into play, allowing driver and team to focus on race setup. The car ran 37th in Friday’s opening practice with his best of 12 laps clocking in at 185.722mph, just over 3 seconds off the pace of session leader Brad Keselowski. Marks joined the remaining Open Teams in skipping Happy Hour and grabbed 31st in qualifying with a lap of 187.384mph, fastest of all Open Teams by a full half-second over Beard Motorsports’ #75 Chevrolet with Brendan Gaughan. Starting last on Sunday was Canadian star D.J. Kennington, back in NASCAR for the first time since a one-off Truck Series effort in Mosport. Kennington had rejoined Premium Motorsports for the first time since a disastrous engine failure at Daytona in July, and this time welcomed sponsorship from Dirt and Rock on his #55 Toyota. Like Norm Benning the day before, Kennington was handed a redundant unapproved adjustments penalty that kept him in the rear along with the penalized Kevin Harvick and Kurt Busch along with Mark Thompson, Kennington’s teammate. Unable to turn a lap in practice, Thompson’s first timed circuit came in qualifying, where he outpaced four other drivers to line up 36th. With that run, the 65-year-old driver made history. 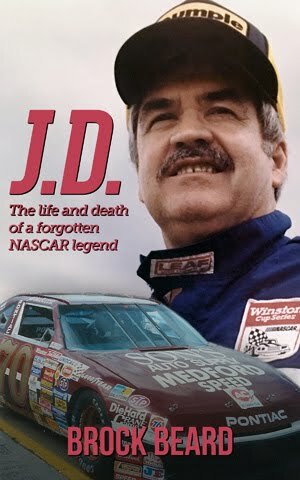 Sunday’s race was the first Cup Series event he had entered since the 1994 Daytona 500, where his car was withdrawn following a serious crash in the ARCA 200. His timed lap was his first qualifying effort since July 1993, when he missed the cut for the Pepsi 400 at Daytona. And, with exactly 40 cars for 40 spots, Thompson was assured to make his first Cup start since June 14, 1992 at Pocono, when he drove for Henley Gray. When the race started, Thompson lost touch with the draft, and by Lap 2, was already three seconds behind Kennington and the rest of the field. On Lap 15, as officials alerted him that the leaders were closing, a first round of pit stops by the Ford teams shuffled the order, dropping Aric Almirola to the rear in his #43 Smithfield Ford. It was around this time that Marks, running at the back of a second smaller pack behind the leaders, smacked the outside wall. Marks made it to pit road on Lap 17 without drawing a yellow, and the crew made repairs to the right side of the machine. As Thompson slipped by to 39th on the track, it was Marks who instead became the first to lose a lap. Inside two minutes on the “Crash Clock,” Marks returned to the track, only to pit again on Lap 19, this time complaining of a battery issue. Marks again made it out before time expired on Lap 23, but a vibration forced him to complete just one more circuit. 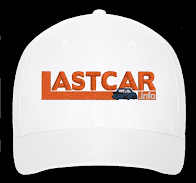 After limping around on the apron, he pulled behind the wall, where the car was soon retired. Seconds later, Thompson’s day ended when the Chevrolet teams attempted their own green-flag stops as a group on Lap 26. A slowing Jamie McMurray was rear-ended by Erik Jones at pit entrance, steering McMurray’s #1 Cessna Chevrolet into the path of Jeffrey Earnhardt’s 333 Hulu Chevrolet. 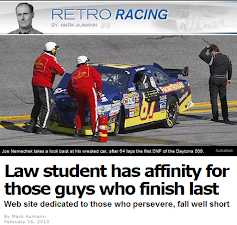 As Thompson neared the scene, he turned to the right, nearly clearing McMurray’s car. But instead, the two made contact, steering Thompson into the outside wall. All four cars involved, including Jones, who caved in the nose of his #77 5-hour Energy Extra Strength Toyota, were eliminated in the wreck, filling out the Bottom Five. 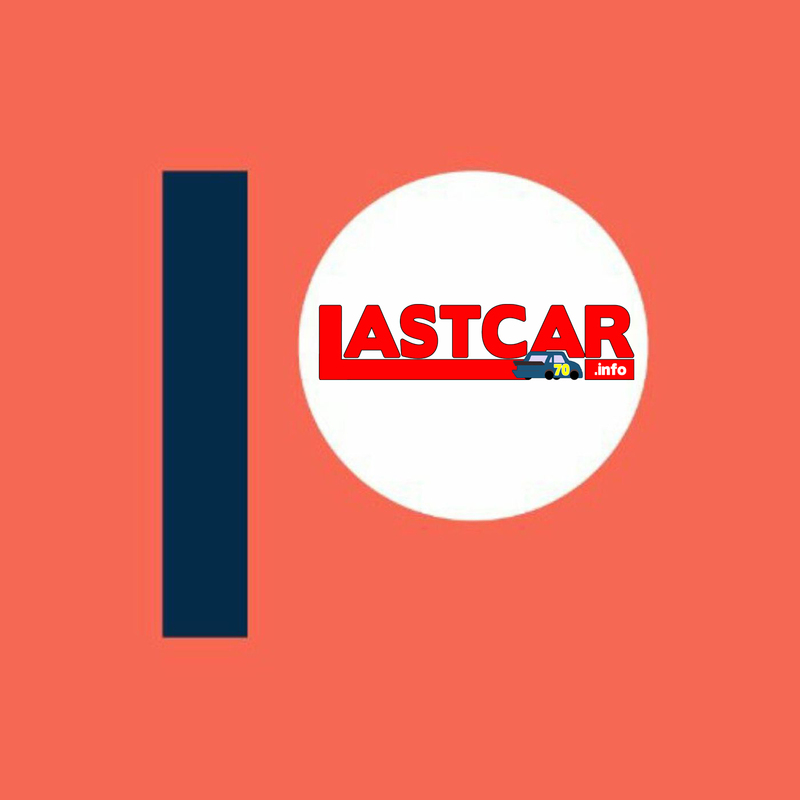 Among the headlines at the front of the field was rookie driver Gray Gaulding, who in the current LASTCAR standings leads all drivers without last-place finishes in both Bottom Fives (8) and Bottom Tens (17). On Sunday, Gaulding bested his career-best finish of 20th at Talladega in the spring with an 8th in the #83 Dustless Blasting Toyota. It was just the third top-ten finish for BK Racing, and came despite heavy damage suffered in one of the many late-race accidents. *This marked the first last-place finish for car #7 in a Cup Series race since July 26, 2015, when Alex Bowman lost the engine after 78 laps of the Crown Royal Presents the Jeff Kyle 400 at Indianapolis. It’s also the first for the number at Talladega since May 10, 1997, when Geoffrey Bodine’s #7 QVC Ford lost the engine after 78 laps of the Winston 500.